A series of articles which involve painstaking research, reconstruction and review. Television as it happened – a document of the history of this once popular medium. Mayhem and mirth on the streets of Peckham. 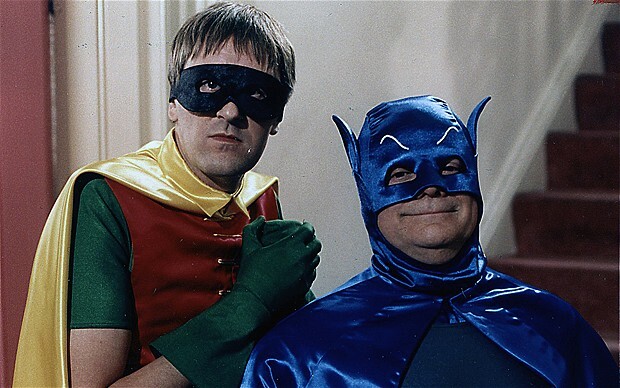 “Only Fools and Horses” was a cheaply realised situation comedy or ‘sitcom’ that ran for a couple of seasons in Britain in the 1980s. 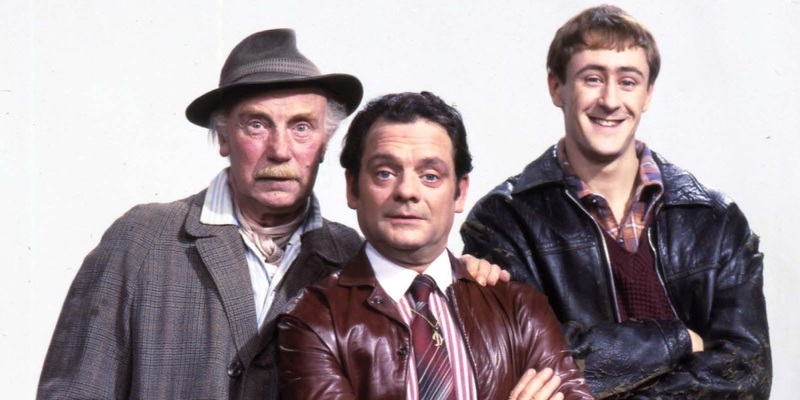 Set in Peckham, London, it starred David Jason as Derek ‘Del Boy’ Trotter, a wheeling dealing confidence trickster of French extraction and his kid brother Rodney ‘Dipstick Plonker’ Trotter portrayed by Nicholas Lyndhurst. Their comedy japes were ruined by a character called ‘Uncle Grandad’, a war veteran who had seen action in an assortment of frigates off the coast of Gibraltar. Uncle Grandad was played by several actors which did cause viewers some muddle. The production team chose to conceal this confusing casting by having Uncle Grandad adopting comedy disguises: turbans, sunglasses and an unlikely outsized beard. 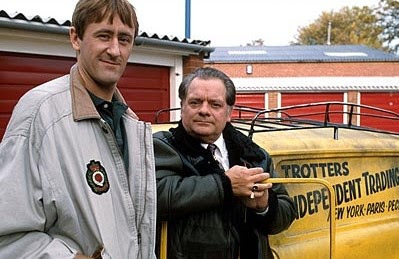 Typically an episode would consist of Rodney ‘Dipstick Plonker’ Trotter finding a valuable heirloom in Del Boy’s garage and selling it down the market for a million pounds with hilarious results. The programme was cancelled after three seasons due to a disastrous drop in ratings as the writer ran out of valuable items for Rodney ‘Dipstick Plonker’ Trotter to find. Viewers complained in numbers after an episode entitled ‘Elephant in Peckham’ was shown which depicted Rodney finding a gigantic African bull elephant hidden under a carpet at the rear of the garage, claiming that it was ‘unrealistic’ and ‘strained the viewers credibility’. A SEEDY FLAT IN PECKHAM, LONDON. TO THE REAR IS A COCKTAIL BAR. FURNISHINGS ARE SPARSE. SEVERAL MISMATCHED CHAIRS ARE GROUPED AROUND AN OLD TELEVISION SET. LITTERED AROUND THE ROOM ARE VARIOUS INCONGRUOUS ITEMS SUCH AS BOXES OF TOILET TISSUES, SEVERAL TRACTOR TYRES, A PILE OF OLD STYLE VIDEO CASETTE RECORDERS. CRASH ZOOM TO SHOW A HEAVILY BEARDED MAN WEARING SUNGLASSES AND A TURBAN SITTING IN ONE OF THE CHAIRS. CUE SOME CHEAP ‘COMEDY’ SOUND EFFECT FROM STOCK – FOR EXAMPLE A SWANEE WHISTLE OR FART. PAN LEFT TO SHOW A MIDDLE AGED MAN HOLDING A FRENCH STYLE BREADSTICK OR ‘BAGUETTE’. HE IS GRATING SOME CHEESE. Del Boy. Is my breakfast ready? Mon dieu, mon dieu, crème de menthe. You dozy old twonk. Can’t you see that I am grating the fromage? Fromage? What’s that then, Del Boy? Is it eels? I don’t like eels. I had a bad experience with an eel during the war. Adolf Eelter. Adolf Eelter? Cor blimey, Guvnor, après ski, après ski. The only eels you ever saw was them high ‘eels when you was dressed as a prostitute spy behind enemy lines. DEL BOY PUTS DOWN THE BAGUETTE. HE MOVES TOWARDS THE COCKTAIL BAR. Where are you going Del Boy? Pierre du temps! I’m going to lean on the cocktail bar, you dozy old bark, shut your noise! LEANING AGAINST THE COCKTAIL BAR, DEL BOY FALLS STRAIGHT THROUGH IT AND LANDS ON SOME TYRES CAUSING HIM TO BOUNCE SEVERAL TIMES. CUE CANNED LAUGHTER. Have you fallen through the bar again, Del Boy? Boeuf a la mode! You dipstick, Uncle Grandad! Course I have. You wally. Stone me! You’re always falling through them bars, Del Boy. You’ll do yourself a mischief. During the war, we was trained to fall through bars. Mars bars. Mars bars. Mange tout. What does he take me for? A plonker? You twonk! CUT TO DOOR TO SHOW RODNEY ENTERING HOLDING SOMETHING IN HIS HANDS - A FAKE POTERY SILVER TELEPHONE MONEY BOX. You fallen through the bar again, Del Boy? Pot Pourri! Course I have, I have to do it every episode. Have you been in our garage again, Rodney, you dipstick plonker? What you got there, Rodney? Cor Blimey, it better not be another giant African bull elephant like the last time, you plonker, Rodney. Fromage frais, I still got bleeding nightmares about taking that past Peckham peanut shop. You said we would be millionaires! Well I had to pay that bloke nine sovs to replace all them peanuts, you dipstick! Sorry about that Del Boy. Mickey Pearce said he knew a bloke that wanted an elephant as a pet and was prepared to pay top dollar for our elephant. Still that’s all over with now. Look what I found this time! Please! Not another nautical nightmare, Uncle Grandad! Fermez la bouche! This ain’t no ‘German unexploded booby trapped fake plastic bomb telephone mine’, Uncle Grandad….at least…I DON’T THINK SO! What’s that ticking noise? Like a clock? Mon dieu mon dieu can you hear it? It’s most probably Uncle Grandad’s belly. Most strange noises seem to come from his direction. Let’s take this not actually a ‘German unexploded booby trapped fake plastic bomb telephone mine’ down the market and we’ll be millionaires!! Right you are, Rodders! This time next year, he who dares wins and other cobblers. Here, Del Boy – what if it is an ‘German unexploded booby trapped fake plastic bomb telephone mine’?